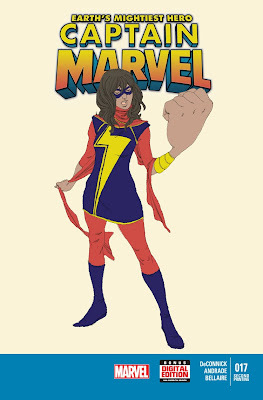 FIRST APPEARANCE OF THE ALL-NEW MS. MARVEL GOES BACK TO PRESS! It’s the story the whole world is talking about, seen everywhere from The New York Times to The Colbert Report – the new Ms. Marvel is a hit! And today, Marvel is proud to announce that Captain Marvel #17 – featuring the very first appearance of Kamala Khan – has sold out at the distributor level (though copies may be available at retail level) and will immediately be going back to press. From the red hot creative team of Kelly Sue DeConnick & Filipe Andrade comes your very first peek behind the curtain at the breakout character of 2014 – with an all-new cover featuring Kamala herself! Don’t miss out on the first appearance of the newest Marvel hero when theCaptain Marvel #17 Second Printing Variant hits comic shops this December!